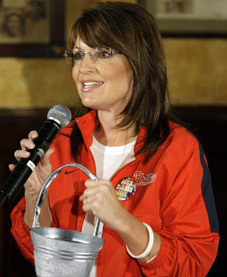 Wasilla, AK—To protest the FDA’s decision to ban trans-fatty acids, Sarah Palin arranged a defiant demonstration. To the horror of onlookers she proceeded to chug a bucket of partially hydrogenated oil. More determined than ever not to be labeled a quitter, the former Governor of Alaska finished the bucket within minutes and then joked about having a second bucket for dessert. ← The Tea Party Band Has All Your Block-a-Billy Favs!